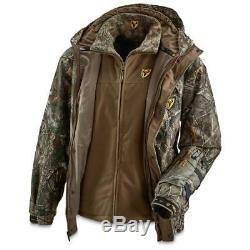 Scent Blocker Outfitter Jacket 3 n 1 system coat parka breathable waterproof 2XL. The Scent Blocker Outfitter Jacket features Trinity Scent Control Technology that is exclusively developed to adsorb and control human odor. The jacket has BodyLock Technology that prevents odor from escaping easily, forcing it out through the scent adsorbing filters at key exit points of the body. Outfitter jacket provides superior waterproofing and breathability due to its RainBlocker technology that restricts outside moisture and allows inside perspiration to disperse through the membrane system. The outer fabric of this jacket has water repellant hydrophobic coating that makes it more comfortable. This jacket has a full front zipper with storm flap, one zippered chest pocket and two lower front zippered pockets for utility. 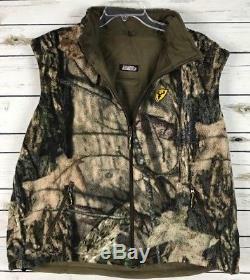 Outfitter Jacket Features: Size: 2XL. Camo: Mossy Oak Break up Country. Trinity scent control technology - For maximum odor adsorption. 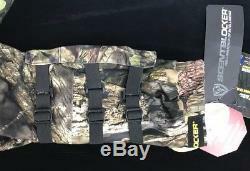 Innovative safety harness slit - For easy attachment & concealment. BodyLock Technology - Prevents easy escape of odor. 100% Polyester micro brushed Tricot - With zip-out WindBlocker sherpa fleece vest. Full front zipper with storm flap. One zippered chest & two lower front zippered pockets with welt - Provides storage & accessibility to the essentials. RainBlocker technology - Provide waterproof, windproof & breathable environment. Durable water repellency - Provide water repellant hydrophobic outer coating. Adjustable / Removable arm guard to fit RH or LH. Visor hood With crown & side adjustment. The item "Scent Blocker Outfitter Jacket 3 n 1 system coat parka breathable waterproof" is in sale since Wednesday, September 19, 2018. 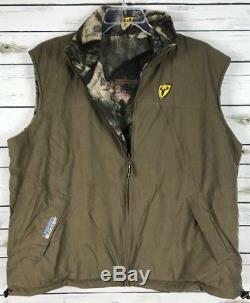 This item is in the category "Sporting Goods\Hunting\Clothing, Shoes & Accessories\Coats & Jackets". The seller is "pwsenterprises" and is located in United States. This item can be shipped to United States, Canada, United Kingdom, Denmark, Romania, Slovakia, Bulgaria, Czech republic, Finland, Hungary, Latvia, Lithuania, Malta, Estonia, Australia, Greece, Portugal, Cyprus, Slovenia, Japan, China, Sweden, South Korea, Indonesia, Taiwan, Thailand, Belgium, France, Hong Kong, Ireland, Netherlands, Poland, Spain, Italy, Germany, Austria, Israel, Mexico, New Zealand, Philippines, Singapore, Switzerland, Norway, Saudi arabia, Ukraine, United arab emirates, Qatar, Kuwait, Bahrain, Croatia, Malaysia, Brazil, Chile, Colombia, Costa rica, Dominican republic, Panama, Trinidad and tobago, Guatemala, El salvador, Honduras, Jamaica.